Imagine dancers on a stage performing modern choreographic movements. Now imagine physics students getting up on stage with the dancers to expand their understating of the laws of physics. 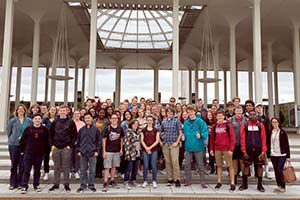 That is the experience that awaited students in Lisa Reece’s science research and Gina Buffardi’s physics courses at the Performing Arts Center, University of Albany on Oct. 3. Equal parts lecture, demonstration, performance and discussion, the ChoreoPhysics program interplays science and dance to explore core physics principles such as vortex shedding, pendulum wave motion, reflection/refraction, centripetal force, symmetry breaking, projectile motion and quantum beats. 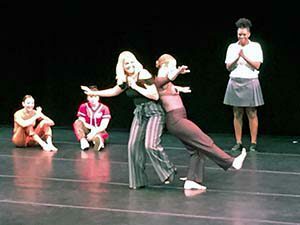 “As someone who has not taken physics, I did learn a lot about the principles of motion and that was very much assisted by the visuals of the dance,” said Annabel Field, a science research student. 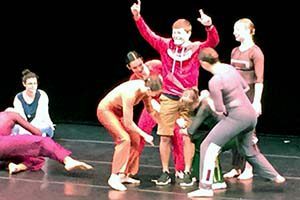 Students were invited on stage to help demonstrate complex concepts using relatively simplified movements, such as weight sharing with the dancer. “It was an excellent way to bridge the sciences and the arts in a way that makes both concepts easy to understand,” student Lauren Lepre said. 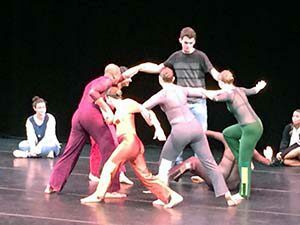 ChoreoPhysics is jointly presented and performed by Professor Keith Earle of the University of Albany’s physics department, choreographer Ellen Sinopoli, and the Ellen Sinopoli Dance Company. “It really set a model for an ideal way to teach traditional concepts through the use of more creative means,” said student Henri Prevost.